Greetings, Stampers! It's Sunday and time for another fabulous Paper Players challenge! 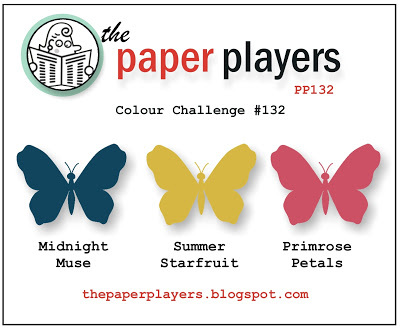 This week Ann has a color challenge for us: Midnight Muse, Summer Starfruit and Primrose Petals. I love color challenges and had something in mind right away. All three of these colors can be found in Patio Party Designer Series Paper, so that was used as a base layer on my card. I wanted to mimic the banners in the paper, so I used the Hearts a Flutter stamp set in all three colors. 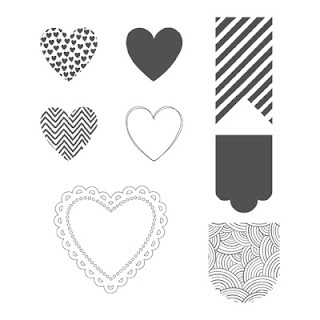 This stamp set is so not only for Valentine's Day! These great banners can be used for any occasion. I adhered a piece of white Baker's Twine to the back of my banners and tied a bow at each end. A few Dimensionals give the banners a little "lift". Thanks for visiting and please leave a comment! Inky hugs! I love your card, Sandy! That paper is perfect for this challenge (wish I had it), and I love how you used the Hearts a Flutter banners with it. This is a really cute layout! Beautiful colors and I love the banners! Oh my gosh! I so love these fun banners! Awesome, Sandy! Another cutie, Sandy! Love it! Good to see you posting; I was worried you were hammered in that snow and lost power. OMG! I never thought to use this stamp set with these colors...they look fabulous! Very clever, Sandy! Hope you're not buried under too much snow! This is just terrific! I love how you continued the banner theme from the DP...so sweet! Sandy, this is fabulous. I love that the banners on the front panel echo the banners on the background dsp.